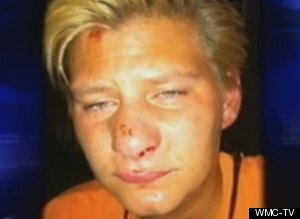 Jackie Lloyd, brutally attacked because of her sexual orientation in Memphis. Memphis, Tennessee – A lesbian suffered a brutal beating Sunday, June 24 at a Memphis bar and restaurant while casually speaking with a former high school classmate, WMC-TV 5 reports. Jackie Lloyd told reporters that the attack which broke her nose in two places and left her face severely swollen came out of the blue. “I think it has everything to do with my sexuality,” Lloyd said. Brandon Hooper, 28, boyfriend of Lloyd’s classmate, charged across the patio of Celtic Crossing, shouting gay slurs. According to Lloyd, Huffington Post reports the moment of the unprovoked violence: “This guy says you f**king dyke and slams me right in the nose and I fell back about three feet… he called me a f**king lesbian, [he said] ‘problem solved, you f**cking lesbian. '” Police apprehended Hooper and charged him with aggravated assault for the attack. When questioned by the press about possible hate crimes charges in the case, the Memphis District Attorney said that such charges would have to come from the FBI. Lloyd says her contacts in the Memphis Police Department indicate that an FBI investigation into her case may be pending. Lloyd says she had never met Hooper before the assault. She believes that his homophobia triggered the brutality simply because she was speaking to Hooper’s girlfriend. Lloyd wants her chance to confront her attacker, and give him a piece of her mind. “You know, I’d like to say to him I want to live a normal life just like everybody else,” Lloyd said to WMC-TV. “And what you did is terrible,” she added. For Lloyd and the besieged Tennessee LGBTQ community, intolerance is an everyday fact of life. Right wing politicians in the legislature of the Volunteer State have tried to ban the use of the words “gay” and “lesbian” in Tennessee public schools (Don’t Say “Gay” Bill), worked to make bathrooms off limits to transgender persons (Bathroom Bill), and have attempted to protect bias driven speech against LGBTQ school students when the perpetrators claim a religious motivation (License to Bully Bill). The attack against Lloyd marks the second grave anti-lesbian incident in recent weeks. Two teenage lesbian lovers were shot near Corpus Christi, Texas on June 10, leaving one girl dead and the other seriously wounded. She was punched in the face because she was aggressively hitting on Brandon’s girlfriend. I doubt any extremely homophobic people would just be hanging out at Celtic Crossing. This “girl” Jackie presents herself as a man and in her first report to police she even stated that she thought Brandon thought she was a man. Get your facts straight and stop supporting drama queens!